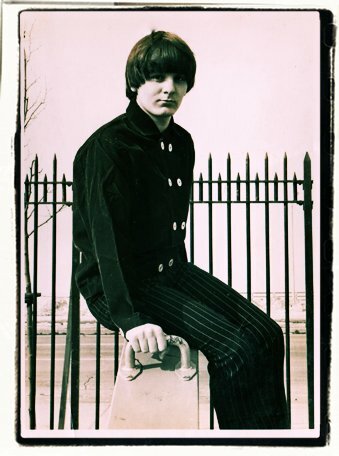 Tom mentioned to me that he was friends with ex Cats Meow and Beeds lead guitaist Pete Carver and at last I'm proud to feature his great groups on my website. 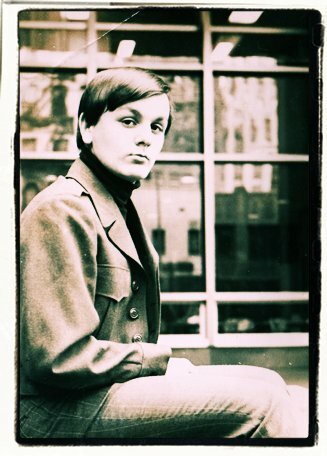 Pete has sent over some exclusive pictures of himself during his 'group years' and has answered many questions I sent to him via his pal Tom. How did the Cats Meow get together and who was in the band? We were originally a cover group called The Chanters, from Staten Island, New York. We had Alan Forlenza on rhythm guitar and vocals, John Ventura on lead vocals, Bob Chirelli on drums and myself (Pete Carver) on lead guitar. We made a lot of music for a band with no bass! Later, just before “Run To Her”, we had a personnel change. Alan and Bobby were no longer with the group. We had Jay Klied on drums, Richie Martinis on guitar and vocals. Lester Margolies came on as our bass. How did the deal with Decca Records come about? A relative of a band member knew Jimmy Calvert & Norman Marzano. They asked them to give us a listen. Jimmy & Norman came to a rehearsal, liked what they heard and offered us a production deal. The Song 'La La Lu' is an extremely catchy pop song with a ‘Revolver” era Beatles guitar. It’s got “hit” record all over it. How well did it do? Any Radio airplays? It did well all over the world, but not much promotion from Decca here in the U.S. It was #1 in Hong Kong, Asia, France and did well in Germany. Here at home it made it to the top 100. When did the guitar enter your life? At about ten years old. My father and his best friend, a full-blooded Cherokee Indian would always be playing country, you know, like Hank Williams and Ernest Tubb. I’d sit and intently watch and listen. The first guitar I learned was a lap steel guitar. Where did The Cats Meow practice? In the basement of the house I was living in. West Brighton, Staten Island. Where did the Cats Meow hail from? For the most part, Staten Island, but John Ventura was from Rockaway, Queens, New York. Did The band perform on any TV shows? We did “Upbeat”, which was out of Cleveland, Ohio and regional TV out of Boston, Massachusettes, and one in New York and Washington DC….the names escape me. Wish I could find the tapes! Why did the band decide to change it’s name from the Cats Meow to The Beeds? That was due to a label change…Decca to Buddah…and a contractual conflict. 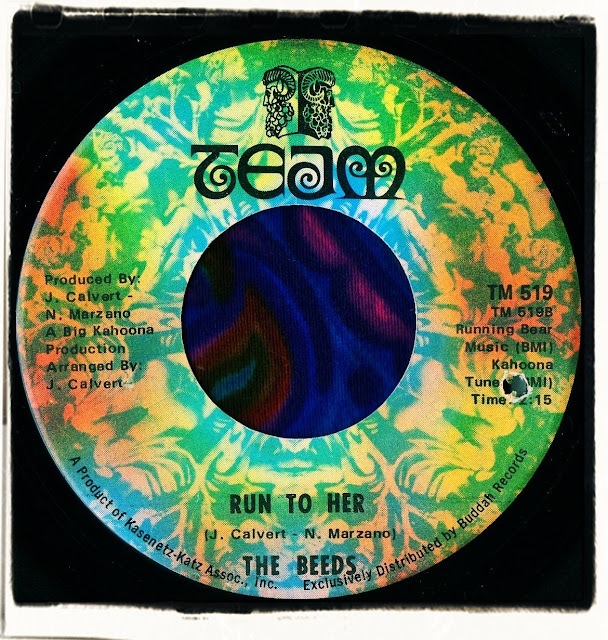 The Beeds record 'Run To Her' is a way cool psych bubblegum song. How did this do? 'Run To Her' also did well outside the U.S. It hit #1 in a lot of countries, keeping 'Raindrops Keep Falling On My Head' at #2! But here at home, not much airtime. I’m amazed at how many hits it has on YouTube after all these years! What songs were the band doing at gigs. Did you have any other originals in your set that were never recorded? There were some that were recorded, but never released, such as 'Spirit Of The Days Gone By', which I feel was the best record up to that point….also we did 'Born Too Late'. 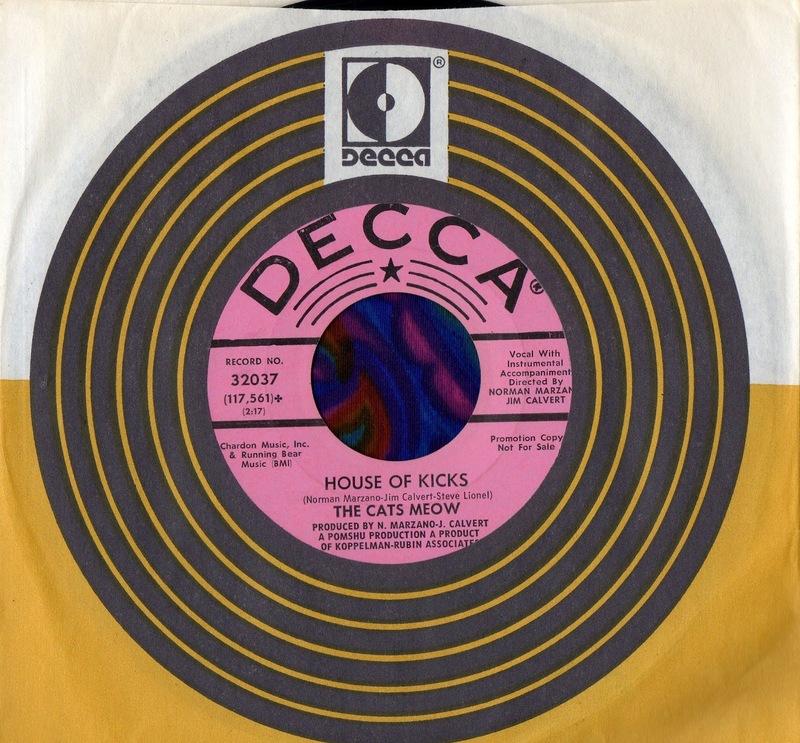 At gigs we did mostly Top 40 stuff…a lot of Shirelles and Dusty Springfield...a few by the Walker Brothers. The band had a lot more depth live than the records the producers made. Did The Cats Meow/Beeds gig extensively? What was the local scene like? The gigs were constant. Always plenty of places to play! As far as the scene, there were lots of local bands who didn’t get to record, but got live gigs. It was a hot era. A great time to be in a band; there was a lot of talent back then. Were you friends with any other groups in the area? How would you rate The Cats Meow/Beeds as a live band? Of course, I would feel we were great. Unique for the time, and John Ventura had a very unique voice. Did the Kasenetz-Katz team have any input with your records? No, it was Jimmy Calvert and Norman Marzano, they did all the production work. We used Regent Sound and The Hit Factory. I remember watching Lou Christie finishing up 'Lightning Strikes'. Was the band happy with the results of the recording sessons? Wow...man, we were just kids. Just happy to be in the studio. What did we know, we got signed right out of the box! What kind of distribution did the records have? They were on major labels, but the distribution was low. Decca was more of a Patty Page label. We were the first Rock group for them. They really didn’t seem to know what to do with us! In fact, 'La La Lu' got more play time locally by another local group who covered it extensively than the radio. 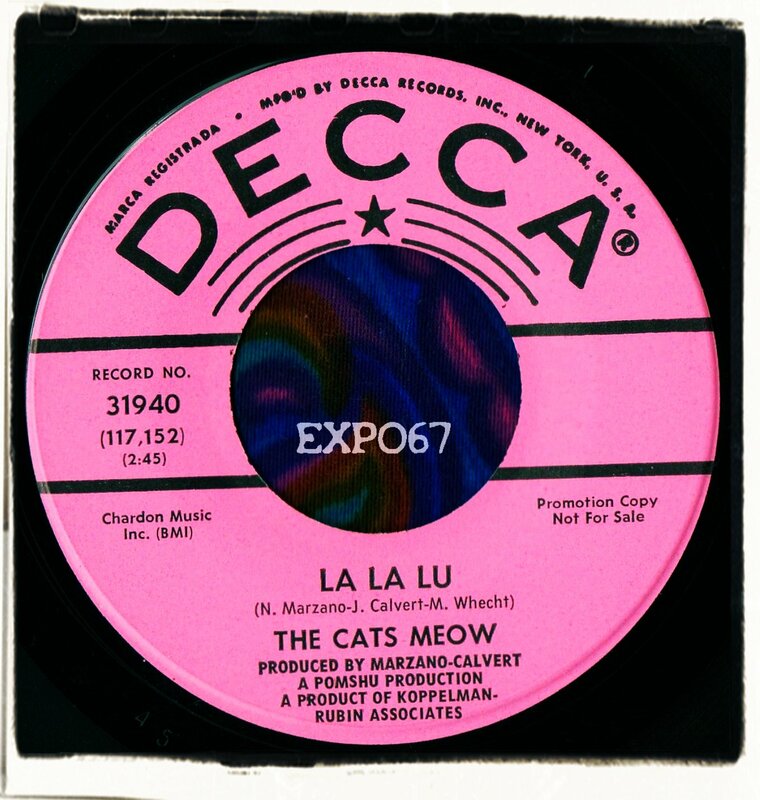 'La La Lu' is a melodic bubblegum pop song with a very catchy chorus and '66 period Beatlesesque guitar runs. Unfortunately, not much information exists online about The Cats Meow but it has been suggested that they hailed from Staten Island, New York. The flip 'Confusion' is a fast paced swingin' guitar beat instrumental with terrific drum action. The Cats Meow have been somewhat short changed when it comes to compilations. Their second 45 top side 'House Of Kicks' did make an appearance on Pebbles -Volume 13 in the early 80s but since then nothing! Band members Norman Marzano and James Calvert would change the band name from The Cats Meow to The Beeds and sign to Buddah off shoot label Team. Check out the bubblegum classic 'Run To Her' on one of those old Mindrocker comps. hello i am a friend of the other guitarist lester margolies. if any of the other members of the band the cat;s meow is reading this please visit my profile to see the pic of the band i have it on my facebook thanks .